What is “Dormancy”? What happens when plants go “Dormant”? To those of you new to the four seasons of Northern Arizona: Autumn is a time of intense transition in yards and landscapes. Leaves fall off of leafy trees, and flowering perennials bloom one last time before fading underground until spring. This is when evergreens are most noticeable in landscapes even through Winter’s coldest nights because they don’t shed their green needles or go dormant. Many of Watters’ customers from the deserts of Scottsdale, Tucson, and Palm Springs are often bewildered by their gardens and landscapes. What does it mean when a plant goes “dormant”? In gardening, the term “dormancy” refers to a perennial plant’s state of temporary metabolic inactivity or minimal activity. 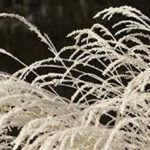 Plants generally go dormant in response to adverse growing conditions, such as those of the coldest months, November through January. (Grass lawns can go dormant during periods of intense heat or drought in summer.) It’s important to remember that perennials don’t die during this period, but are in a state of suspended animation. While the outer leaves and above-ground foliage may die back, life still lurks in the plant’s core and roots. If you’re unsure which of your garden plants are annual or perennial, stick an irrigation flag or popsicle stick into the ground marking your dormant plants. Next spring you will find out which was a perennial that decided to rest through winter, and which plants died completely as an annual! Dormancy is not used to describe annual plants with life cycles of a single growing season. Their biology doesn’t include the mechanism for going dormant. Plants stop growing and conserve energy during this period of dormancy until the right growing conditions present themselves the following spring. This happens naturally as the seasons and weather change. This change can also be provoked artificially. We force many perennials into bloom before their natural bloom cycles. By tricking the plants into flower we can have them out of season for particular holidays. Tulip and daffodil bulbs can be artificially chilled to send them into dormancy, then brought out of dormancy at the desired time, and forced into bloom when required, as for Valentine’s Day. The same technique is employed for Easter lilies. 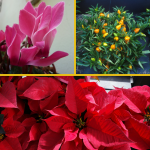 This week we forced poinsettias, cyclamens, and ornamental peppers to come into bloom for Watters’ holiday plant shop. This process is positively unnatural for living plants but necessary to have them for our customers who traditionally cherish them for the holidays. For perennials in outside gardens there is a potential danger should plants break dormancy too soon. 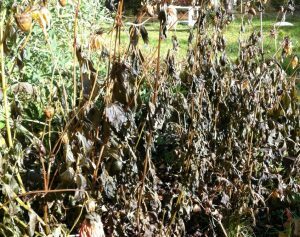 Many perennials are lost when an unseasonably warm cycle causes plants to send up new growth which is killed when the weather turns cold again. 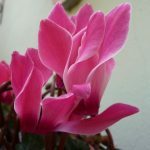 In the mountains of Arizona, it is recommended that gardens be covered with a 2-3 inch layer of mulch as protection from dramatic freeze-thaw cycles that wreak havoc with so many perennial plants. Which plants are best planted now without fear of mountain dormancy? The new batch of evergreens, spruces, and pines, just arrived for the winter planting season. Most are ready for outdoor or indoor holiday decorating. Of course, cut Christmas trees arrived this week. They’re ready for interior ornaments and for presents tucked under their long swooping branches. Many plants have been forced into beauty for indoor decorating for the holidays. 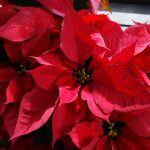 Just after the Thanksgiving holiday, we see unusual poinsettias, cyclamens, air plants, and a host of festive bromeliads ready as special gifts for friends and holiday hostesses. They make really special table decorations for the Christmas feast. 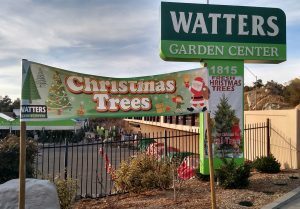 Until next week, I’ll be helping local gardeners choose just the right evergreen trees and holiday plants for the festivities that lie ahead. Ken Lain can be found throughout the week at Watters Garden Center, 1815 W. Iron Springs Rd in Prescott, or contacted through his web site at WattersGardenCenter.com or FB.com/WattersGardenCenter . Copyright ©2017, WATTERS GARDEN CENTER. All rights reserved.